Our orthopedic memory foam seat cushion is not too hard, not too soft...it's just right! Try it today and your body will thank you tomorrow! We love our customers! Please contact us if you have any questions or comments. We guarantee your satisfaction! 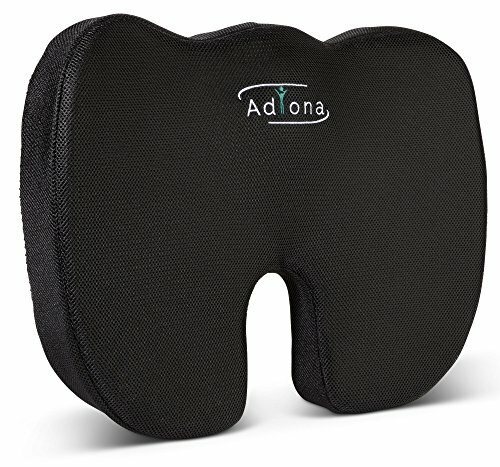 ★ ERGONOMIC SUPPORT: high-density memory foam coccyx cushion removes pressure on tailbone while sitting and promotes healthy posture and spine alignment while preventing pressure ulcers. U-shape specifically designed to gently suspend tailbone with contoured design to promote even body weight distribution and eliminate pain in tailbone, hips, spine and buttocks. Promotes good circulation in legs, alleviates back pain, lumbar pain, neck pain, and arthritis in hips. ★ LONG-LASTING, PREMIUM QUALITY: will not flatten out like other seat cushions; 2-3 second rebound time and is ultra-supportive. Anti-bacterial, anti-fungal, hypoallergenic interior and cover with removable, MACHINE-WASHABLE polyester mesh. Helps to prevent sores for those who are wheelchair or bed-bound. NON-SLIP BOTTOM keeps cushion securely in place. ★ BREATHABLE: one of the few cushions that comes with a breathable (yet soft!) 3D mesh cover to ensure ultimate comfort in all conditions. ★ PERFECT FOR THE TRAVELER, DESK WORKER, SENIORS, OR PREGNANT WOMEN: this seat pillow fits car, truck, airline and train seats to meet your traveling comfort needs. Try it while driving or at home; it's even great for your recliner, couch, kitchen chairs, or rocking chair. Weighs just a pound and comes with a handy side strap for EASY TRANSPORT. Try it for hemorrhoid relief! ★ 100% SATISFACTION GUARANTEED: We are passionate about providing a positive experience and quality product! If you don't love it, return it for your money back. If you have any questions about this product by Adiona, contact us by completing and submitting the form below. If you are looking for a specif part number, please include it with your message.